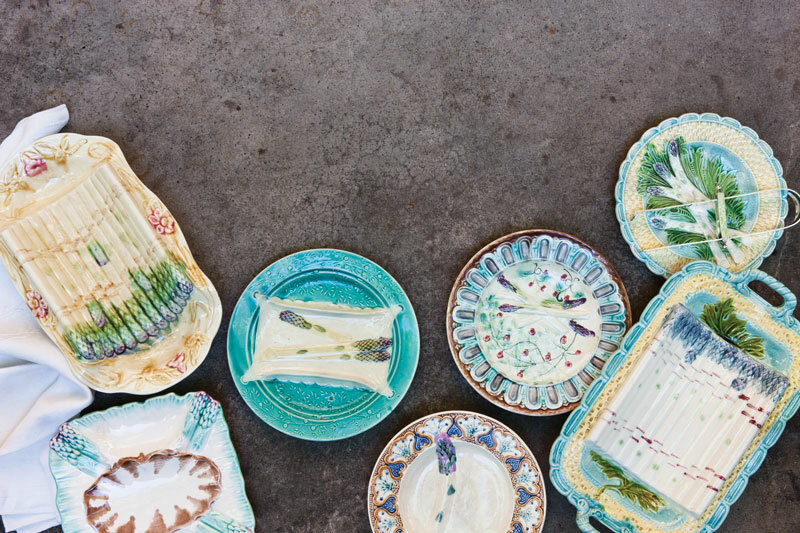 As a publisher of several food-focused titles, I’ve long been fascinated by the history of tableware, particularly when it serves a hyper-specific purpose. Proprietor of the New Orleans French Quarters’ Lucullus and Louisiana Cookin’ contributor, Patrick Dunne, delights us month after month with his musings on culinary antiques. His latest article on asparagus was no exception. I hope you’ll enjoy reading about the history of asparagus accoutrements as much as I did! “The French,” my grandmother said, leaning forward and raising those pale eyebrows to indicate she was about to impart a great truth, “the French find it proper to eat perfectly cooked asparagus with their fingers.” Like many of her confidences, it was both enigmatic and complex. The regime of our family table seemed irreproachable, but still we ate the quasi-limp spears with a fork. This left me to question not only our ranking on the propriety scale, but also introduced a heretical doubt about whether we were enjoying perfect cooking. Many years later, in my late twenties, I was invited to lunch at L’Espadon in Paris, and across that glittering faded pink room was a lady of incomparable elegance, delicately dipping her white spring asparagus in a butter sauce without soiling her fingers. I was transfixed with awe and melancholy, realizing that my grandmother, as always, had been right. When humankind first took to eating these delicately colored shoots, once botanically associated with the lily, we do not know. Tomb paintings indicate that the Egyptians offered bundles of asparagus to their gods, but whether they also ate them is uncertain. We do know those unashamed gluttons, the Romans, were great asparagus lovers, and the vegetable is mentioned by almost every classical writer on nature. Pliny brags on an asparagus stalk that weighed over a quarter of a pound, without leaving a hint of how tough it must have been. Apicius, mysterious author of a late Roman cookbook, leaves us a recipe for asparagus casserole that reminds me of those ghastly experiments in country club cooking that afflicted the mid-twentieth-century American palate. Oddly enough, asparagus was one of those popular foods that fell through the kitchen cracks after the collapse of the classical world. Fortunately Islamic preservationists, who kept alive most of the intellectual heritage of Rome, reintroduced asparagus to Spain and Italy. Nevertheless, throughout the Middle Ages it was still mostly monks who cultivated small crops for medicine, while most of the asparagus patches went wild and neglected until they were rediscovered by a few late-Renaissance cooks in Italy. It was really not until well into the 17th century that asparagus re-entered the culinary repertoire of France. Memoirs of the period reveal it was still a rare dish during the reign of the Sun King. Louis XIV, however, a great lover of his vegetables, succeeded in cajoling La Quintinie, royal supervisor of the potager, to figure out how to grow it year-round. Eventually the best asparagus was grown outside Paris near Argenteuil, and France went on to become the largest producer of the vegetable in Europe. The question remained how to eat it. Despite the widespread use of the table fork by the 18th century, Hannah Glasse, the last word in food and decorum in Georgian England, was still advising her readers in The Art of Cookery (1747) that for eating asparagus no good alternative had been found to the fingers, and that the fork was practically useless. Hardly a generation later, the French, or at least Parisians on the eve of the revolution, were using implements. That cranky old Benjamin Franklin, much beloved by the ladies of France, scandalized them by ignoring his fork and taking up his spears with his fingers. The triumph of table tools was near at hand and being felt at every repast. Asparagus tongs, cradles, specific plates, and individual pincers would come and largely go over the next two hundred years, but the popularity of the plant endured and seems unlikely to suffer the exile it felt after the fall of Rome. What are your favorite culinary antiques? My Mother always had asparagus growing in our garden. She loved it. I was not very fond of it until later years. One of my sons-in-law and his and my daugher’s children love asparagus. But, I never thought about eating it with my fingers. Interesting story! Great article, and I also have a favorite asparagus dish that I serve my asparagus on. And I do eat asparagus with my fingers. Several years ago, I spent a few days with my husband’s great-aunt Rosie in Uelsen, Germany. There was an air of celebration in that beautiful town because it was the time of “spargel” harvest. White asparagus. I spoke only English, she only German. Our language barrier did not stop us from having a most enjoyable time! Food helped us to communicate without words. We ventured out to the farmer’s market and I watched as she carefully chose each spear of spargel. I learned that it is white because of the farming practice of keeping it covered over with dirt until it is cut. We returned home where Tante Rosie peeled the spargel, cooked it in butter, and served it on a specially designed asparagus dish. I later bought a specially suited dish for asparagus in memory of that wonderful experience. Today was Tante Rosie’s last day of 93 years on earth. She shared three of those days with me. Three days that I will never forget. I had never before heard of anyone eating asparagus with a fork. When we lived in New Zealand asparagus was very cheap and plentiful. Wonderful. Of course in the old days it was difficult to cook it in those tall pots and I am thankful that now it is so easy to lie the spears on a plate for the microwave. A family favourite. What an interesting message about asparagus. My husband worked for a short time in Eastern Washington and asparagus grows along the side of the road like a weed. It’s not one of my favorites but dipping it in Ranch dressing sounds delicious. Sadly, I have an allergy to asparagus, but as soon as we have our first local crop, I make them for my husband. For him, this means spring has truly arrived. I don’t know if this is considered a culinary antique, but my mother used to slice radishes on top of lightly buttered French or rye bread, sprinkling them with a little bit of salt. This was a favourite of mine during the summer months. I thought that my mom was being thrifty. Perhaps she was, but years later I found out that the French very often ate their radishes the same way! OMG these are fantastic! I was just preparing a post about the many kinds of asparagus in France–it’s sold at every wide spot in the road, it seems. It’s only fitting that it would get its own special dishes. What a delightful article Phyllis! 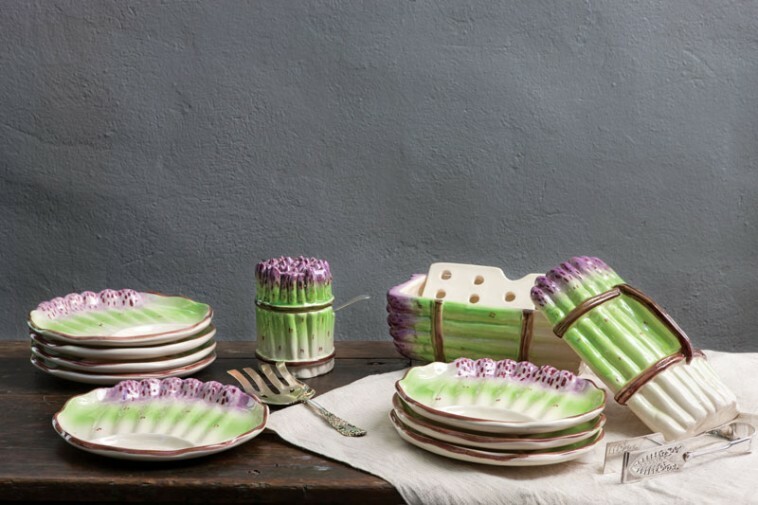 Actually, antique majolica with asparagus and artichokes is one of my very favorite antiques here at FrenchGardenHouse. Both at home and in the shop, the pieces like those shown in the photographs are so colorful and decorative, that I love displaying them. I adore asparagus of all kinds, but will admit to loving the fatter, white European variety the best!